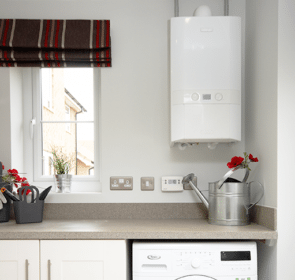 A system boiler is one of the 3 types you can choose for your central heating. But is it the right choice for your home? How much does it cost? Will it keep you warm effectively? Read on to find out! A common problem people face when they are shopping for a boiler is the amount of brands and models available. Upon finding so many boilers to choose from, you might feel overwhelmed by the choices. So how do you find the right system boiler? One way to help with your decision is to take a look at prices. Understanding what you should expect to pay is crucial to making the right choice. You’ll be able to identify boilers that fall within your budget range. Below is a table showing several system boiler models and their prices. A system boiler will require a fairly significant expense. But if you take a minute of your time to send a quote request to heating professionals, you’ll save up to 40% off of your system boiler. 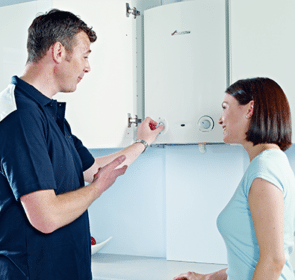 With our free form, you are able to compile the prices of multiple boilers and installers. Arm yourself with the detailed information you need to find a system boiler at the right price. “What are system boilers?” “And how do they differ from a regular boiler?” These are two questions you are probably asking while shopping for a boiler. A system boiler is a boiler with several components included in the unit. These include an expansion vessel and a pressure valve to protect the whole system from excess water pressure. It works by drawing water from your cold water mains supply and heats up the water, which is powered by the ignition of fuel. This hot water supplies the taps in your kitchen, bathroom, and utility. It also is pumped to the radiators in your house to provide space heating. System boilers work similarly to conventional, or regular, boilers. They still provide hot water and heating in the same way—burning fuel to warm up water. However, the main difference is the parts built into the unit. Since the system boiler unit comes built in with certain components, it requires less space than conventional type boilers. 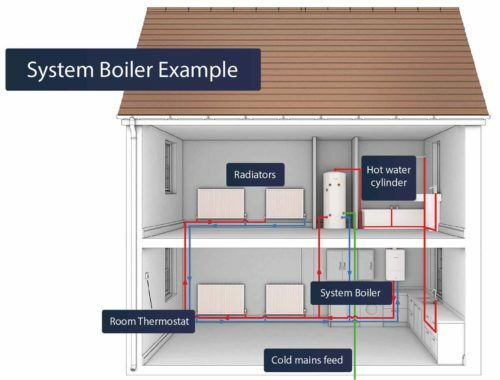 Usually, with a conventional boiler, the expansion vessel is placed in the loft space together with the cold and hot water cylinders. Instead this tank is built into the boiler itself. Also, most system boilers don’t require a separate cold water storage tank, freeing up even more space. 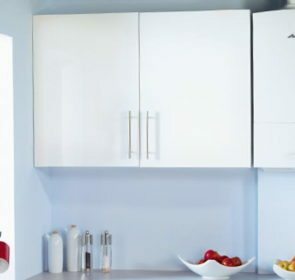 Cold water is supplied directly from the mains connection of your home. 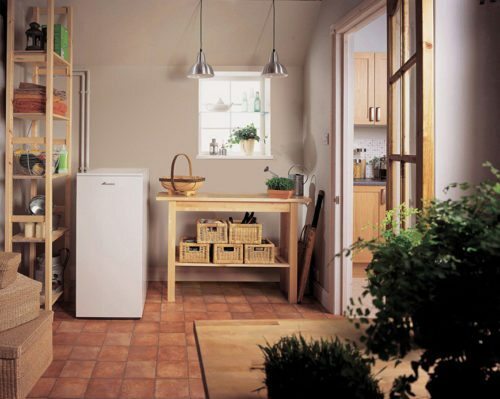 However, it still uses a hot water vessel for storage—this can be placed either in your loft or utility closet. The next step in your decision making process is to read about the advantages and disadvantages of system boilers. With a system boiler, you free up quite a bit of space. Since there is no need for an expansion vessel and cold water storage cylinder, you have more space in your loft or utility room. The fact that the system boiler already contains certain components such as the expansion vessel, it is easier to install. 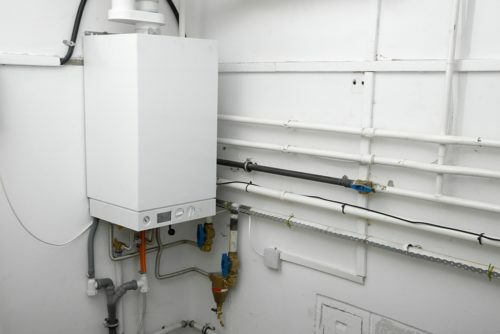 System boilers work wonderfully for homes with a high hot water demand. You are able to turn on multiple taps at once without a loss of performance. Also, the boiler includes a pump to transport hot water quickly when requested, delivering a fast response. Although a system boiler is not as expansive as conventional types, it is still larger than combi boilers. You’ll still need to install a hot water tank, and the actual unit itself is quite bulky. With a water tank, there will be some heat loss as the hot water is not used immediately. As such, you’ll need to insulate the cylinder. And if you run out of water, you’ll have to wait a long time for the boiler to heat up enough water again. How can you source both the right system boiler and a reliable installer in one go? By obtaining multiple quotes, you will be able to make your search much easier. And comparing prices will allow you to pinpoint the model that matches your heating preferences and budget. Fill in our free, secure form and soon emails from 5 local heating professionals will arrive in your inbox.